or to flesh out a destination your family has already chosen. Click here to read the Go! International page. Please add to our list by clicking HERE! Review: I lived for about a total of 1 year and a half in Seattle in the 90's before I took my family to enjoy it over the span of 5 weeks in 2017. During that time we did EVERYTHING, but here are my top recommendations. I love this just for the wandering. Like people watching. Like sampling local foods. Like unique and hand-crafted gifts and souvenirs. Depending on when you go, it can be crowded, so I would recommend pairing little people with older buddies and choosing a meet-up time and place when you get separated, which you inevitably will as interest in all that is for sale will vary. (Strollers and wagons will make this place tricky to navigate.) 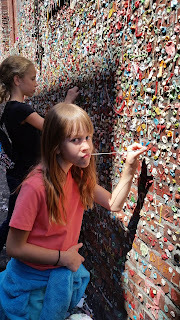 Don't miss seeing, and adding to the gum wall. (BYOGum) It is in Post Ally right by the market. And right by the gum wall is a fantastic improv comedy theater. It was my favorite thing as a single adult with fantastic late shoes for older audiences. 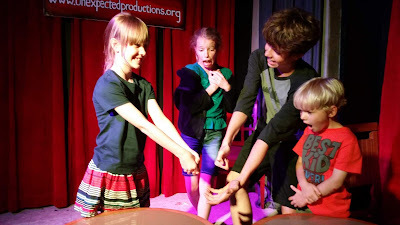 BUT they also have shows for families (running not as often). It was a huge hit with my crew. Check out the schedule of shows here. Close to the market, along the water front is a souvenir shop called "Ye Olde Curiosity Shoppe." Go in. We didn't make any purchases. (I'm a horrid tight-wad.) 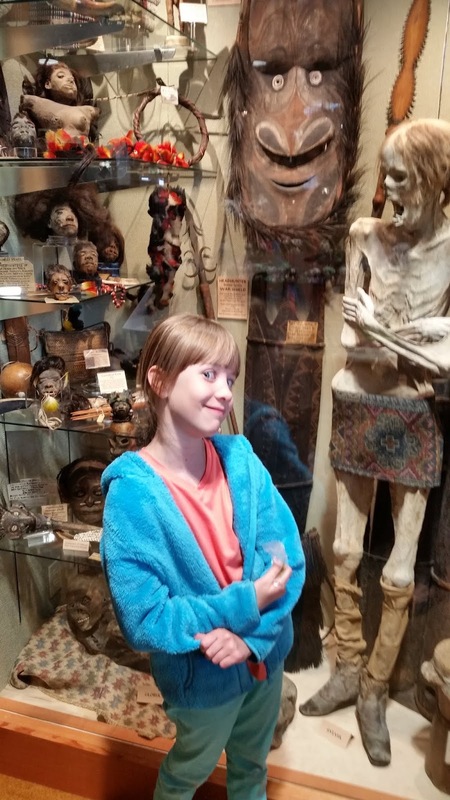 But there are so many fun things to see: a mummy, shrunken heads, a mermaid, a two-headed chicken. Exploring here may entertain the kids for free for nearly an hour. 5. And still in that neighborhood, practically at the base of the Space Needle is Chihuly Garden and Glass exhibit. It wasn't cheap, or not as cheap as I wanted it to be, considering it's "just glass." But I am SO GLAD we went. It was breathtaking and worth the admission. The whole fam loved it, although the 5 year-old just wanted to RUN through the whole thing. You can get cheaper tix if you reserve and go earlier in the morning. One of the pieces indoors at Chihuly Garden and Glass. The boat containing the glass is life-size. Catching rays at one of the water features for free public use at the Seattle Center. Bring suits and towels! 6. 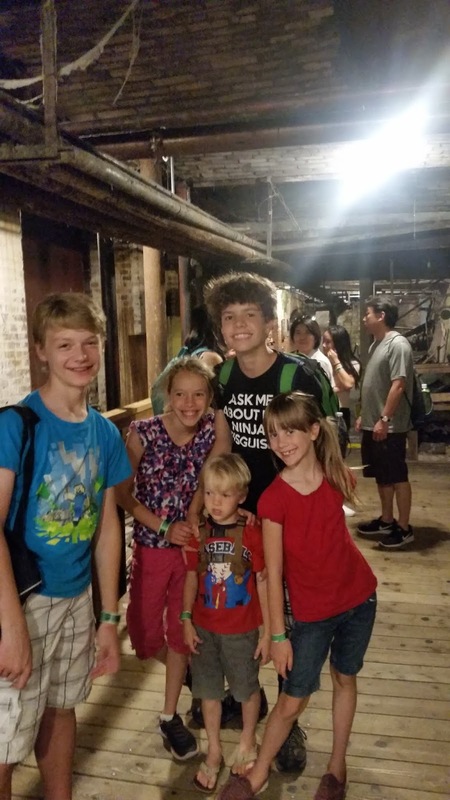 For the history buffs, and everyone else that just wants to be entertained, another MUST DO is the Seattle Underground Tour. This is another, not-so-cheap call we made that wound up being a MAJOR HIT. The tour guides are excellent, and their script runs something like an informative stand-up comedy routine. I liked it so much, I bought the book "Sons of the Profits." 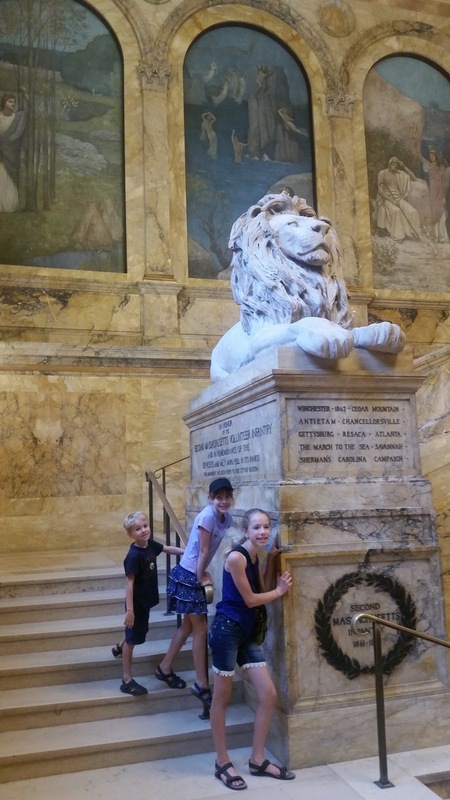 I loved learning about the history of this interesting city! 7. Explore the UW campus. This is just fun. 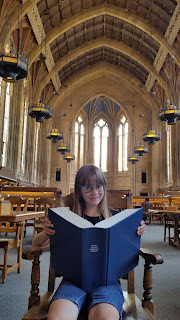 The main library looks like something out of Harry Potter. Other parts of the campus looked liked they could be in Narnia. In the spring, the cherry blossoms are in bloom and line a gorgeous view of a fountain and Mount Rainier in the distance. Cheap eats can be found on "the Ave." Our favorite was a Korean place. And you can rent paddle boats in the UW Boathouse and paddle around Lake Washington (pretty sure I've got the correct body of water), even getting off to explore little islands around the overpasses of the freeway. If you take your time, you might spend an enjoyable day just exploring. 8. 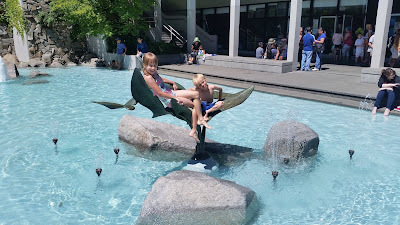 Other hits: catching a Mariners game, taking a ferry to and from Alki beach for a fun day in the sand, the fun architecture of the public library, and black berry picking at every vine we encountered on the side of the road or in the cities wilder parks. Other notes: there are passes that group some of these activities, and you are going to be tempted to purchase one, so let me here state that the Seattle "City Pass" includes a lot I recommend you skip unless you have an abundance of time. We went to the Woodland Park zoo, and had fun. But NOT MORE fun than our comparably sized local zoo. We went on the harbor cruise and had fun. But I've gotten sick on harbor cruises before (thankfully I didn't) and the views are the same on the ferries, which provide admittedly less info, but how much do you want to pay for a "this is that building, that is that building" run-through of what you see? We went to the aquarium. Meh. And no one recommended the Pacific Science Center and reviews said it needed an update. 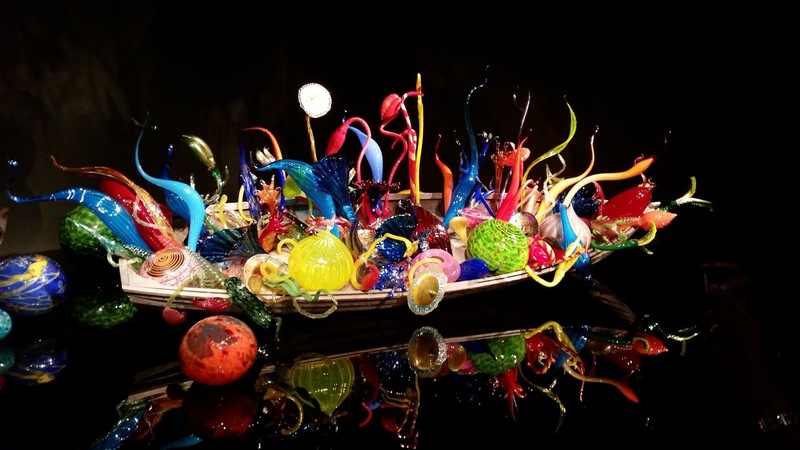 If you want to do the Space Needle AND Chihuly, look for a combo ticket for those two and skip the rest. Where to stay: So hard! It is ALL SO PRICEY. Thanks to Amazon taking over the world, Seattle is growing at a pace that exceeds its growth rate during the Yukon Gold Rush. Driving, and especially parking in the city can be a BEAR, so look for a place to stay with parking included that is accessible to where you want to go by the easy and convenient public transportation. (You can determine this by a search on google maps. Once you have directions from A to B, click on the bus icon at the top, and it will give you multiple bus and tram routes to chose from.) They have bus passes for tourists that be purchased for days or weeks at a time, and before you buy for your littles confirm they aren't already included with your adult fare. You can get to every destination I mentioned above on the public transportation system, and you will SAVE time by NOT having to hunt around for a place to leave the car! Review: Boston is one of America's loveliest cities, with probably a lot more to it than the cool historic sites. But there are SO MANY cool, historic sites you could ONLY focus on those and have an incredible, informative, and FUN vacation. So that's what I'm recommending: a 7 days walk through time and place. These recommendations were our favorite stops and where you will find the biggest bang for the buck - unless otherwise noted. Best of all, many - those I've italicized below - are run by the National Park Service which means that even better than free or reasonably priced, the are ALSO run by incredibly informed and engaging rangers whose capacity to relate history in a meaningful way will THRILL you. STOP and do the ranger talks and programming in these sites. You WILL NOT regret it!!! 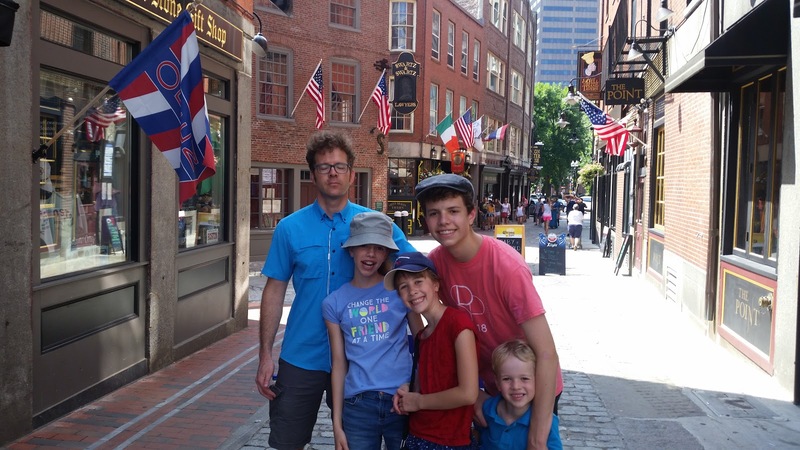 The Boston Tea Party Museum is easily one of our Boston highlights and worth what seems like a steeper entrance fee. 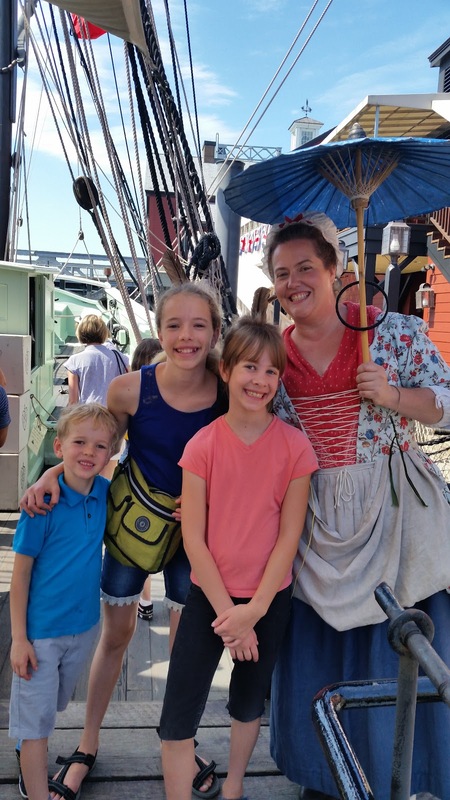 You get to go on scale size recreations of the ships, you get to throw tea into the harbor, your tour is narrated by a costumed, entertaining and enthusiastic guide, and the museum is more like a fantastic Disney experience than a dull home of artifacts. Linger in Abigail's Tea Room after the tour to enjoy some Boston creme pie (additional charge) and learn about (and smell!) the sorts of tea the colonists drank. Then hop on the T and spend time in Boston Common - a beautiful park (with fun water features in and near the playground in the summer - so consider bringing suits) that was home to the regulars encamped in Boston leading up to the Revolutionary War. 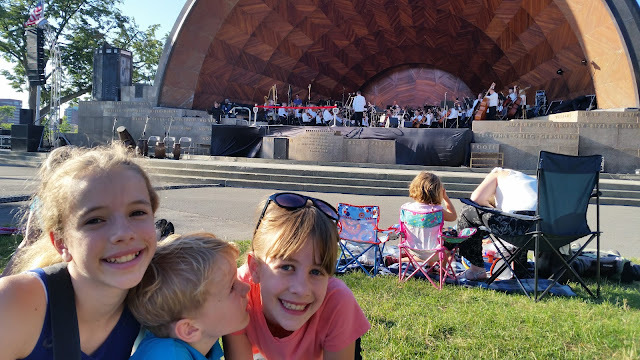 Though the park is now land-locked, it is where the British shoved off from on their way to Lexington and Concord (your destination of the next two days)! The Minute Man National Historic Park includes parts of the trail the regulars marched along on their way to Concord, MA, 11 witness houses - there for the engagements that ensued on April 19, 1775 - and the Old North Bridge! Your first stop here should be at the Visitors Center where you can catch a fun, informative film and visit with the rangers on hand about the programming offered for the day. Grab a map and mark it with the times over the next 2 days were you can catch ranger presentations. We loved our ranger talk at the Old North Bridge and the call to muster and musket demonstration at the Hartwell Tavern. The Battle Road Trail was fun to walk along. The entire area could provide a number of pleasant strolls/hikes or picnic options. And it's all free. The engagements at Lexington and Concord led to the siege of Boston and its culminating conflict is our next destination: Bunker Hill. Atop this rise, there is monument which one can actually go inside and climb to the top if it isn't closed for rain, or heat, or too crowded to be worth the wait. (It was closed for heat when we visited in July.) Here again, the ranger talks made this a fascinating destination. We loved learning more about the battle itself and about a few people on both sides who saw the action. 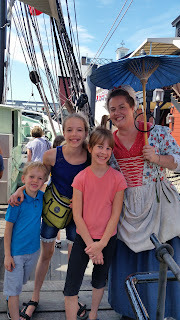 We skipped the Bunker Hill Museum (for time), and walked down to the USS Constitution boat and museum. Though not from the colonial era, this boat was a thrill to be on! 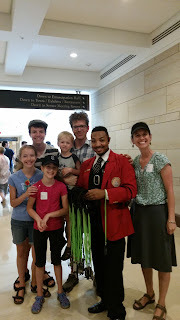 Again, the rangers here, dressed in period sailor uniforms, were so informative, though there didn't seem to be prepared presentations so we just asked endless questions. 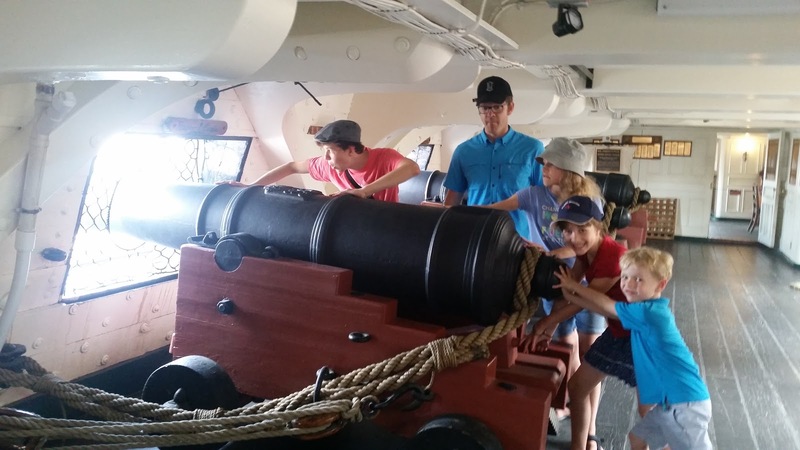 The USS Constitution Museum entrance fee was by donation (and we stiffed them) but the kids loved exploring and learning here, and it provided great context for the significance of the boat we had enjoyed exploring. If I had it to do again, I would have done the museum first. 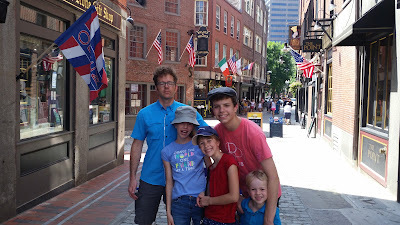 By day 6 you will have walked much of the story of the "Midnight Ride of Paul Revere", an adventure made famous by poet Henry Wadsworth Longellow. And on day 6, you will tour his home, which conveniently happens to be the site where Washington took command of the Continental Army and successfully won the siege of Boston. Check the link for the ranger-led tour - the only way to see the home's interior, and worth it besides. The grounds are lovely and worth a stroll. The home is close to a playground at Cambridge Common, and a short walk from Harvard Square. (The T's red line has a stop there.) Though we didn't, if you want to spend a full day in the area, take a tour of Harvard. 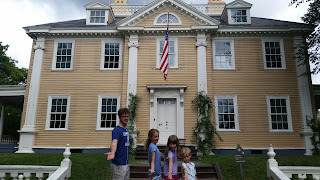 I recommend visiting Adams National Historical Park - John and Abigail Adams homes including Peacefield, where they moved after Adams's presidency. The grounds are lovely, but do the tours - $15 for adults, free for 16 and under. They take you into these homes, Peacefield being the most remarkable with the Adams' personal furnishings and objects still in the home right where they left them!!! (Plan on about 3 hours to see all 3 locations - travel is by trolley from the visitor's center. Travel time from Boston to Braintree is another hour one-way on the T. There were fabulous free activities here on July 4 as well. We were surprised they weren't more inundated with guests, but the holiday offerings were EXCELLENT, so make it a part of the plan if you can! * Indicates a destination not accessible by the "T" - Boston's amazing public transportation subway system. The T is convenient (far more than driving) and inexpensive (less than car rental plus gas plus parking fees) - up to three kids ages 11 and under ride the T and buses free with a paying adult. For days 3 and 4, I recommend renting a car to hit these destinations. During our July stay, car rental was least expensive on the weekends. Otherwise, if you stay in Boston or in other near-by towns, you can get to all the other places, including in and out of the airport, on the T. Lyft or Uber are other convenient options. Boston Public Library - Free and a masterpiece of art and architecture. It is America's first public library operated by a city. SO worth an hour or two to explore! Isabella Steward Gardner Museum - We didn't get into this one. I heard it was worth it, so I'm passing that along. We went on a rainy Sunday afternoon to try and the line was just too long. Museum of Fine Arts - We DID make it into this - we went on the free day (Wednesdays after 4pm) and there was a line, but it moved quickly. (I thought it was so cool that the museums were in such high demand as to necessitate a line!) It was awesome to see famous works of famous artists. With little kids we moved fast and still were there for around 2 hours. Breathtaking! Housing: Inexpensive housing is the killer - it seems impossible to find. We had luck for our month in Boston looking on sabbaticalhomes.com, though most listings there wanted much longer stays. Good luck! Two friends, one who spent a few years in Boston and one who grew up there shared the suggestion to steer clear of Somerville. We did. We loved our North Cambridge home base - as it turned out we were quite close to the Washington Headquarters Longfellow home - but we didn't go anywhere that struck us as unsafe, so most areas will probably be OK. NOTE: Our recommendations are based on our July 2018 experience. Not all destinations mentioned above may run programming in the tourist off-season, so double check that tours, etc. will be open and running. Boston in July had moments of hot mugginess, and the home we stayed in only had window AC units in bedrooms, so if you book a stay privately during the summer, ask about their cooling systems. Overall, however, the weather was pleasant and certainly bearable. Review: Williamsburg, Virginia is the perfect family vacation spot for American History lovers of all ages. Colonial Williamsburg itself is a treasure of interactive history that will take at least 3 days to fully appreciate. So get the 3-day pass - it's only $10 more than the 1 day pass. And PICK UP A DAILY SCHEDULE OF EVENTS. 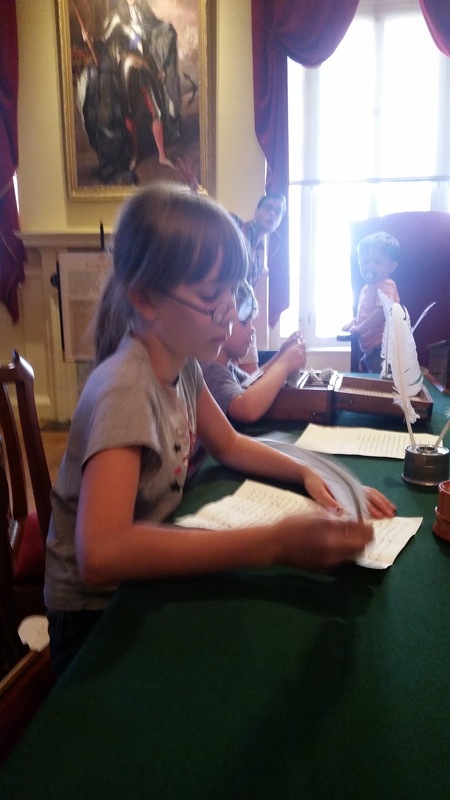 The most incredible part of this destination is NOT the historical and fully restored buildings (like the Virginia State house or the Royal Governor's Mansion which are AWESOME) but the historic interpreters. 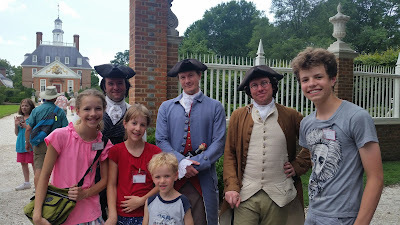 These folks are so well versed in their history that you feel you are having face to face conversations with Thomas Jefferson, George Washington, Martha Washington, Lafayette and others. So hit every opportunity to see any of our history's heavy-weights and fit in building tours around that. 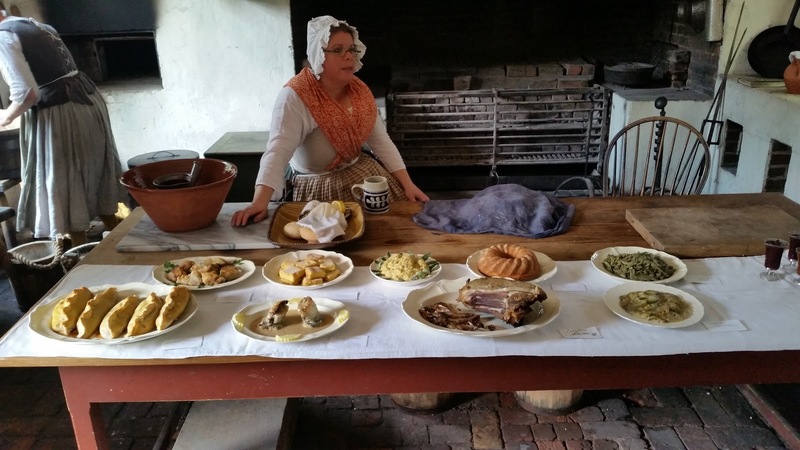 Also not to be missed are the trades - cooking and weaving were our favorite, but gunsmithing, making barrels, etc. are all done on location using the tools and techniques used in the 1700's! A meal from the 1700's, cooked with the ovens and tools of the 1700's! We didn't feel like 3 days were enough, but if you can keep a more aggressive pace than we did, both Yorktown (the main final battle of the Revolutionary War) and Jamestown (the first permanent American colony) are both within a close drive. 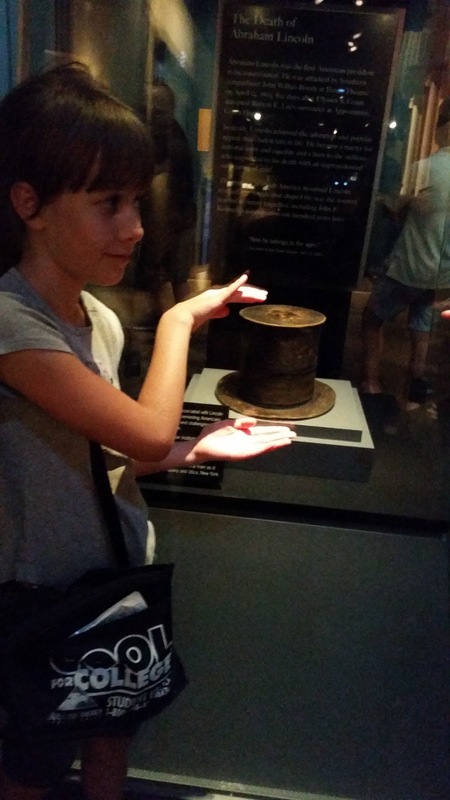 We ran out of time to see Yorktown, but the kids absolutely loved the Jamestown Settlement. 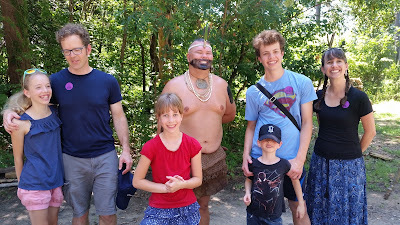 The Wampanoag interpreter visited with us for nearly an hour and the kids couldn't get enough of the Wampanoag village. I loved the recreated, scale size boats, and the indoor museum was extensive and incredibly engaging for my crew of kids ages 6-15. The recreated Jamestown fort was also very cool, but if all the recreation wears on you, you can also visit the real site and archaeological dig. (We didn't.) And if all of that isn't enough, Mount Vernon (George Washington's beloved home), Monticello (Thomas Jefferson's unique projection of himself in architecture) and Montpelier (James Madison's home - we didn't go here) are all within a few hours drive. If you go in peak season, make early reservations for tours of both Mount Vernon and Monticello, and plan for no less than 3 hours at each. Tour tickets include museum admission and the museum at Mount Vernon was another incredibly fun and engaging experience. Monticello was less so, but it's unique design requires more time. 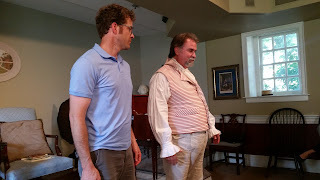 At Mount Vernon we happened on a visit with an interpreter acting as George Washington's personal physician. Dr. James Craik explains surgery, 1700's style! The hour we spent with him learning about the medical tools and techniques of the age was one of our most memorable of the trip so ask when you go in about those sorts of programs in the schedule for the day. Mount Vernon (and Jamestown settlement) had a pretty reasonably priced cafeteria. Both presidents homes are pretty strict about bags and what you can bring inside so if you want to bring your own food, you may need to plan on returning to your car for it and eating it there. As for pricing, the links above are to the pricing pages of each destination. (There is a ticket option called "The Historic Triangle. 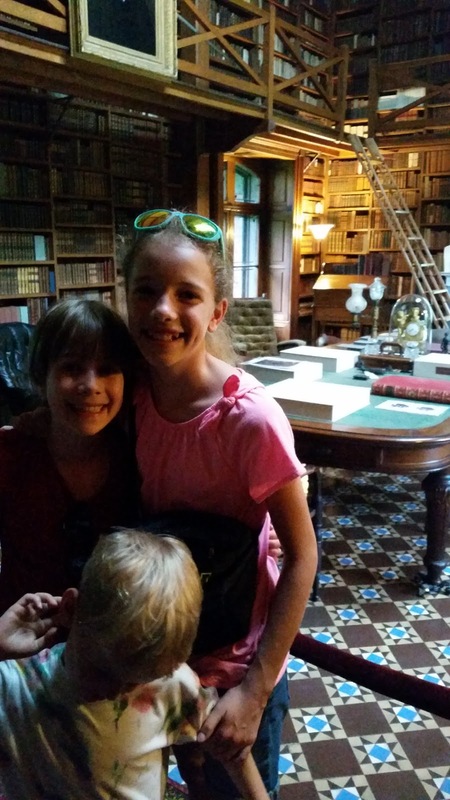 We didn't try it, and it may represent a great savings for die hard history buffs, but my sense is the bigger hit with the kids will be Monticello and Mount Vernon. If you want to see both the Jamestown Settlement and the American Revolution Museum at Yorktown, there is a slight savings to buy the two together. And buying tickets to the presidents homes on line will save you $2-3/ticket.) As for accommodations in the area, there are a number of resorts (time shares without the sales pitch) you can book on Airbnb from around $150-200/night for a family of 6.
Review: Taking in all Washington, DC has to offer is more than a 2-day venture. This review is of a 2-day add on to time spent in Williamsburg, VA, and has a focus on America's founding. With that scope in mind, stops to make in Washington DC should include the National Archives Museum and Rotunda where you can view the Declaration of Independence, the Constitution of the United States, and the Bill of Rights. Admission is free, but if you are going during peak tourist season, a reservation is recommended to avoid waiting in line. Large groups at predetermined intervals are let into the rotunda so getting close enough to see these documents requires patience and assertiveness. 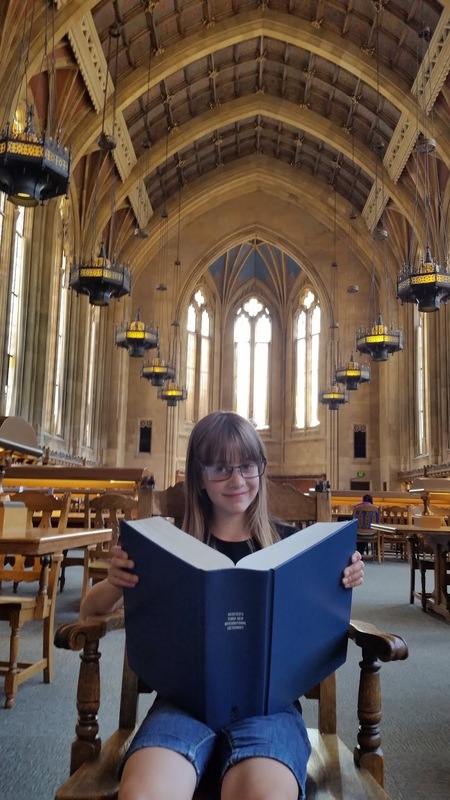 No one is there to explain their significance, so do your study with your kids beforehand so they can grasp more fully why they are protected and honored as they are. Another stop not to miss is the Smithsonian National Museum of American History. Here there is a uniform worn by George Washington, a walking stick owned by Benjamin Franklin, and Old Glory, the flag that inspired "The Star Spangled Banner," our national anthem. (Another tear-jerker - right - is the top hat worn by Lincoln when he was assassinated). 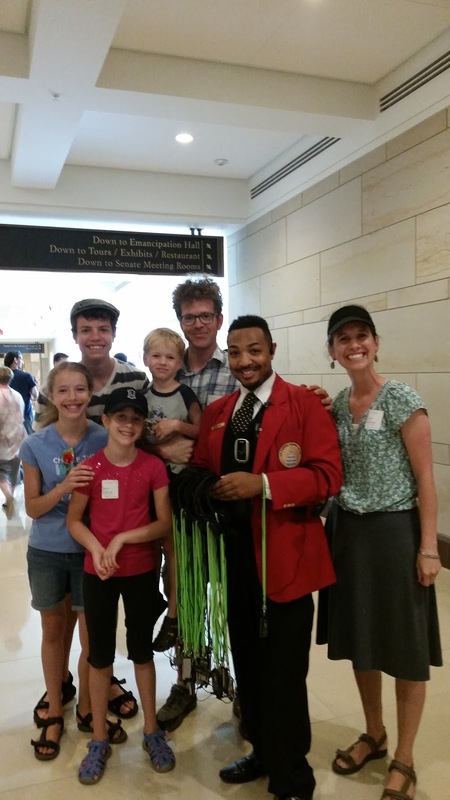 If you want to tour the White House, book with your member of Congress months in advance. It also requires a 3 day booking window, so if you intend to prioritize a White House tour, you may want to schedule this first. across the street (and accessible through an underground tunnel), so hit both and bring a picnic. (We found a break-room with a mircrowave in the basement of the Library of Congress with the help of staff members there. 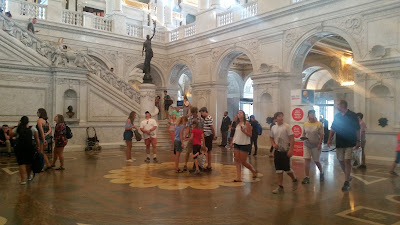 The Library of Congress does offer guided tours, which might have been more info, but they are first come, first serve and on the hour beginning at 10:30. We missed one and didn't want to wait for the next, but it seemed we had access to the same areas without a tour. ) 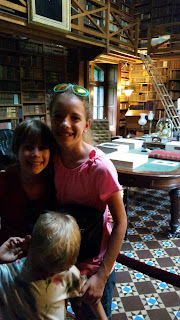 During our visit, Jefferson's library which he sold when he needed cash, could be seen at the Library of Congress along with quiet a few other things of national significance, and the architecture is breath-taking! All of these destinations (and most others) are FREE - by far the best part of Washington, DC!!! Round off your visit with a trip to the Washington and Jefferson monuments and hit both of their homes (see above) on the way in and out of DC from Williamsburg. Assuming you drive to and around DC, check out the website Parking Panda. There you can pre-book parking spots, chose optimal locations of parking garages, and find discounts on daily rates. If you can do DC on the weekend (Sat and Sun), parking is cheaper - even than a family taking public transportation - and with Parking Panda, it is a breeze to find a spot just where you want to be! Review: Has the US Junior Ranger Program, which I will review separately.. This is ridiculously tall, and really a sight to behold! Fun to talk about the Native American legends and scientific theories regarding the formation. These theories also can start a discussion on scientific uncertainty and the Native American culture. There is a trail around the base, which I didn’t feel up to. There are posters about the formation, its sacred nature, and other information in the visitor center. Cost: $28 per car. Additional costs to get up close to the mountain. Review: Interesting Native American Artifacts. The purpose behind the Monument is interesting, it is totally privately funded. I’m obviously uninformed, because I didn’t know that it isn’t complete. The original designer and sculptor is dead, and his family continues the work. There was a very fun Hoop Dance performance, which my girls reenacted later. I was disheartened as the focus of the videos and gift shop are the sculptor and the process rather than Crazy Horse and his people. One example of this was in the gift shop. There was about 10 videos about the sculptor, and the process of sculpting the monument, and none about Crazy Horse. Another example is that about half the space of the museum is a tribute to the sculptors work. They have a junior scout activity, which was essentially a scavenger hunt in the museum. This was difficult, fun, educational and could easily be a jumping off point to more studies. For example, who is Dewey Beard? Why do they have his pipe in the museum? How is he connected to Crazy Horse? Fun and educational. Lots to look at. Cost: Adults (19 and Older): $50 Seniors (55 and older): $45 Teens (13-18): $15 Children (6-12): $7.50 Children 5 and Under are Free! Review: Bounce around in a rickety bus with an ol’ cowboy telling you the stories of his life, the Indians, and the ranch! Hear the love for the horses, the way of life, and our country’s history. You get to see probably more than a hundred horses, in groups, up close, and at a distance. Take water! Very fun to see the horses and to realize there are still wild horses. 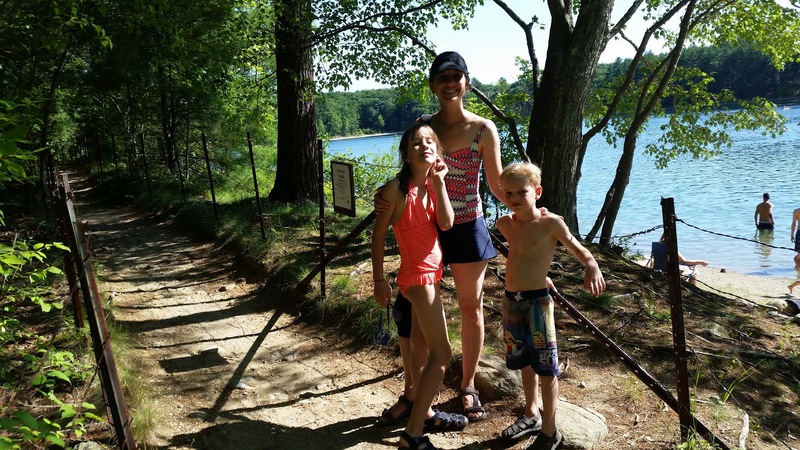 Review: "Walk the Fall River Freedom Trail where you will go under a waterfall. Make sure to have a seat and dip your feet in the warm natural water that put this town on the map." -- I was so very excited to get to walk on the backside of a waterfall!!!! Unfortunately, when I asked at the Mammoth Site I learned that you just walk near the bottom of the falls. Since some of my kids were losing control, we decided to skip that. We drove by and there is a walking path that goes right in front of the fall. NOT what I thought, very disappointed. Review: Grassy, flat, easy to back in, picnic table, fire ring, walking trails, shade. It is amidst a bunch of ponds, so tons of mosquitos. Can hear the freeway, but other than that really nice park. Review: At first, I overlooked this gem thinking that it was just another museum with fossils. I was SO wrong! Very glad I decided to stop. Begins with a 10 minute video explaining the history of the site, followed by a guided tour of the facility. This is a sinkhole that trapped mammoths and other animals that were then preserved. The site is in process of being excavated. Some fossils are preserved in place, while others are still being explored. It was amazing to see actual fossils in place where they have been for so long. During the summer, there are additional activities such as a dig for the kids. If you mention being a homeschooler you can get a discount. Instead of the regular price of $12 per child it was only $6 each! Ages 4-12 (flexible). Once again, I was surprised. This dig was remarkable! Casts of the real mammoth bones are buried in packed dirt(not just covered in sand like other ones we’ve been to). We had to work for those bones! Definitely recommend the dig, it might even be worth $12! A stroller is fine for most of the tour, but you will be happier if you can live without it (there are stairs at one point, where the stroller has to backtrack to get down). All Indoors. Very interesting! We bought a DVD about the site, from the gift shop, so that my kids could continue to learn after we left. Review: Nice grassy area, quiet. You are just off a 2-lane highway, just outside of town. 30 minutes to Wild horse sanctuary, 15 to Mammoth site. 7 or so to downtown. 3 ish minutes to Evans Plunge. Very convenient! A bit of a shock as it is pretty much unmanned. They cut the grass, but I didn’t see any owner until we were almost ready to go after two days. He was very kind, offered to bring us wood for a fire. Note: there is only one shared fire pit. A sign on the office gives a phone number and says theres a house nearby with the owner in it, but I didn't check. Seems to be an honor system. Has two bathrooms, two showers, and a ‘laundry’. I put laundry in quotes as it is a room with storage on the sides and the machines in the back. Nice to let the kids run and play. Old tractors setting among the campsites. Time: Closes at 5pm in summer! Review: The place to start your trip with would be Menno-Hof. (http://www.mennohof.org/) Menno-Hof is a museum dedicated to the telling of the story of the Anabaptists and how they came to the United States to be free of persecution. They are now known as the Mennonites and the Amish. It was such a fascinating visit, with models of the boats, how they ate, actual torture chamber tools on display with how they were used (perhaps skip this part if you have children who are sensitive, or if you are), a tornado simulator (a closet you step in to experience the sound of a tornado hitting your shelter. Quite realistic, so again, sensitive child warning. The largest flea-market in the Mid-west is in Shipshewana. (http://www.tradingplaceamerica.com/) It's fun to peruse and find foods and crafts, many things in Amish country are hand made and of wonderful quality. However, you'll find some of your usual cheapie vendors here as well, so be on guard for that. E&S sales is one of our favorite stops in Shipshewana, IN. Definitely stop here for snacks for the trip, taste as many cheese samples as possible, and if you drove to Indiana and are able to bring things back with you, stock up here because their bulk food prices rival any I've ever seen. Note that they close at 4 PM because they are owned by an Amish family and the Amish work day ends at 4 so that families can be together the remainder of the day. Our family's favorite Amish dining experience is down the road a bit in Middlebury, IN. The place is named Das Dutchman Essenhaus. I highly recommend getting what is called the Family-Style dining, which is kind of like a buffet brought to the table. All dishes are brought to you, and as they empty, will be refilled unless you tell them not to. If you are a mashed potato and fried chicken fan, you may find yourself overly full. (http://www.essenhaus.com/files/2015/Family_Style_2015_wb.pdf) There are other dining options there as well, which can be found on their website at http://www.essenhaus.com. We don't know a lot about lodging in Amish country because we lived in South Bend. I also highly recommend touring Notre Dame if you are that far East from Utah, because it is beautiful and wonderful. Review: This is SO fun! Lots of awesome lego creations to look at, a variety of rides, absolutely astounding water park, and lots of places to let your creativity run wild and build! Plan to take about a week to truly have time to experience everything. After all, you definitely want to have time to let your kids sit and build! When else in your life will you have enough Duplos to build a tower your kids can stand in?!? Many rides have areas nearby that the kids can build in while mom or dad stands in line. If you take it slow, there are lots of opportunities for kids to unwind and just play. If you could only go once, I would try to have all my kids be at least 40" tall and 4 years old. There are very few rides for kids under 40". However, once they are 40" they can ride almost everything. The water park has areas for all ages. I think you'll need two days just to do all of it! My favorite was an area that has water 0-3 ft, with small slides that the kids can go on by themselves. I could sit with my babies, and keep an eye on all the kids as they went down the (small) slides and swam. With the year pass, we were able to go twice with the same cost! That made it over two weeks of vacation activities for $200 per person. Parking is free if you get the Merlin Annual Pass, as well as giving you 20% off the food (which will save you a fair amount too) Beware :) you will want to have money to buy lego sets as they have a GIANT store with all sorts of sets, just budget it in the cost of the vacation ;). Finally, don't forget to get in there and build with your kids! Other notes: Spend a day at the beach near Oceanside Pier - a hit with the kids and its only about 15 minutes from Legoland. Time: Year Round - no closing time is listed on the website! Two hours is enough to take it all in. Review: Cove Fort is located immediately northeast of the junction of I-15 and I-70, in the southeast corner of Millard County, twenty miles south of Kanosh and twenty-four miles north of Beaver. (Click here for a detailed map of Utah.) The website also lists mileage from various surrounding destinations, so check it out to find out if it's on your way. The fort was built to offer protection and refreshment to the traveler. As such it's great place to stop for an hour or two. Learn a bit of Utah history, see a pioneer location. Very similar to a pioneer museum. It is an LDS site, ran by missionaries. The missionaries were very kind and patient with my kids, answering questions. There is a nice picnic area and grass to run in. Each room is decorated with pioneer furniture and household goods. There is a video about the pioneers followed by a tour of the fort. My kids and I both found it interesting. I think the historic perspective would be interesting regardless of your religion. Very nice place to stop. Review: Beautiful scenery, and lessons on erosion! The nature trail is nice enough for strollers or wheelchairs, and has lots of great information on local animals and flora. My kids are still talking about the stuff they learned 3 months later! However, the other trails (we tried two others) were completely unacceptable for strollers. If you happen to go when its raining, you can watch erosion happening which was really amazing for my kids.